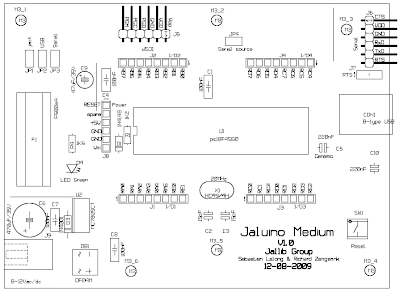 Thanks to Richard's last contribution, we now have a nice schematics for the first version of Jaluino board, and very clean and easy to build PCB. This post is to give an overview of how to build it, but with not so much details. 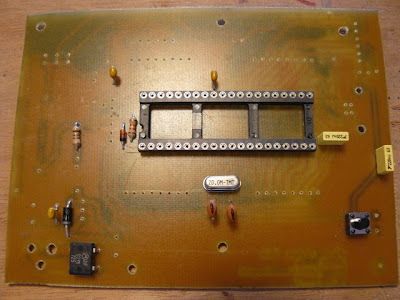 If you want to build it, you'll have to be familiar with PCB creation. 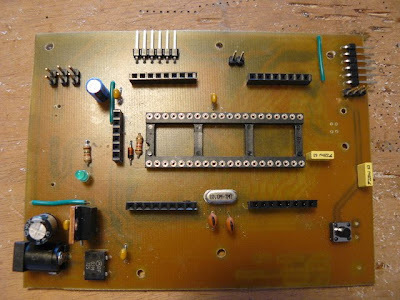 That said, having this board within your hands is really nice ! It really helps thinking about what could be done with it, what could be improved, and is a nice base to start thinking about building shields. So, here we go ! 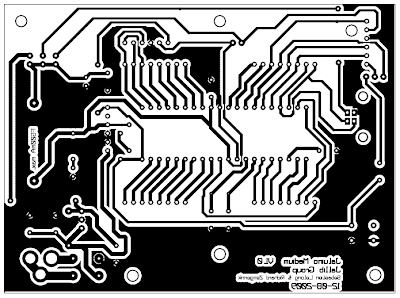 First of all, you can find all schematics, PCB and many more details in jallib SVN repository, under "/project/jaluino" directory. Don't print and use this image ! Use the PDF file here, and print it at scale 1:1, that is, without any zoom-out or zoom-in correction. 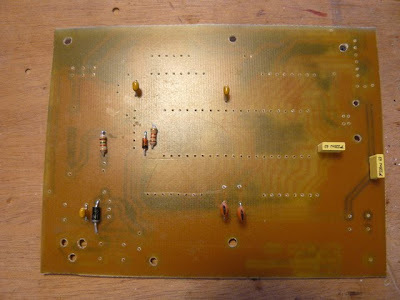 If any doubt, once printed, put the microcontroller support on the paper (or the like) and check all pins perfectly fit all holes. 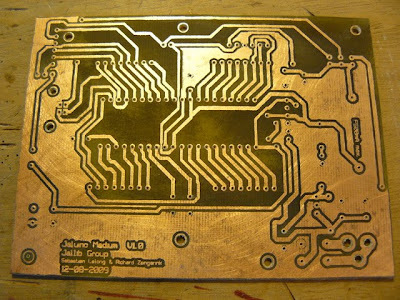 As said, PCB creation is easy. 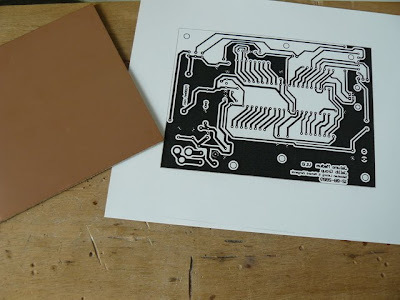 I use the toner transfert method, using glossy photo laser paper (dedicated to laser printer, not ink-jet). 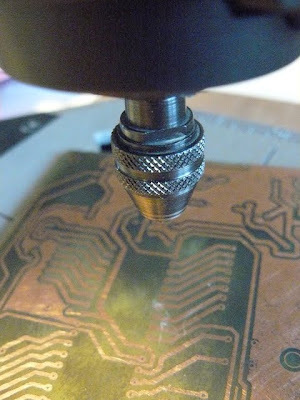 If interested, have a look at this post, explaining how to do this, step by step, with a video. 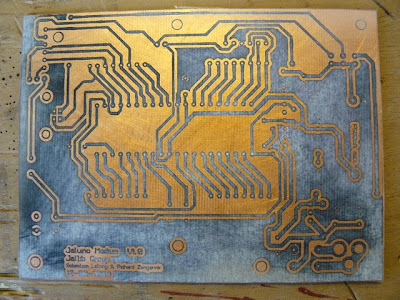 Once the transfert is done, the PCB is ready to be etched. 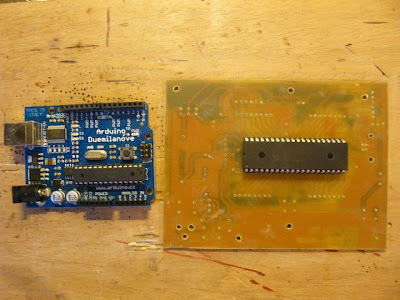 A brief comparison between original Arduino and Jaluino. 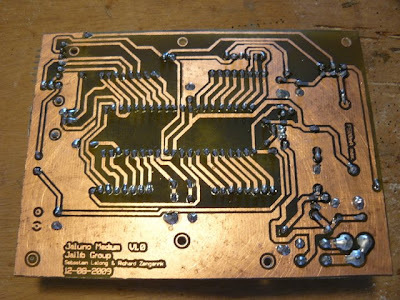 Jaluino is obsviously bigger, but embed a much bigger chip, and most importantly is made homebrew! 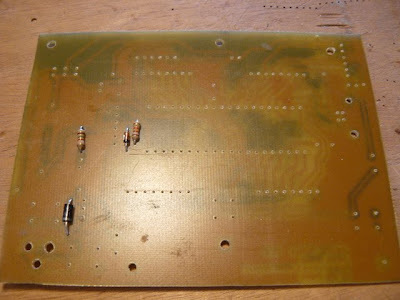 I try to start soldering components from the smaller & lower ones, to the biggest and taller ones. 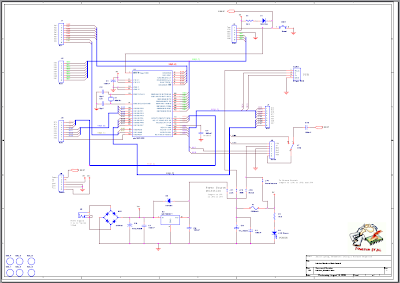 We'll follow this component diagram, provided in PCB PDF file (page 2). 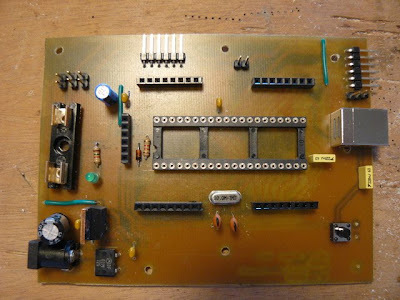 Solder shield connectors, serial and ICP connects. 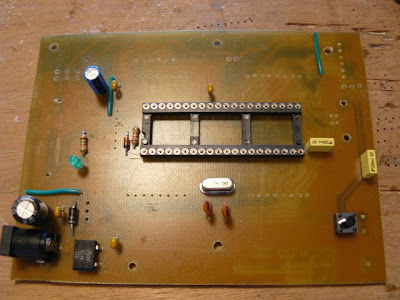 Add 7805 voltage regulator. Don't forget jumper for power selection and RTS reset feature. Place your favorite 18F4550 onto the support, and don't forget the fuse ! You're done, kudos ! 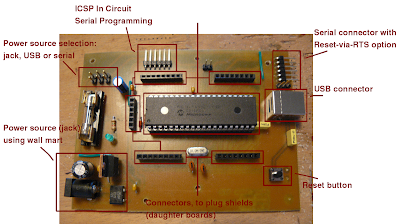 Now here's a brief map showing the different features coming with this board. Note: one important missing feature is I²C support, which surely will come in the next version. I already tried quite few things with this board: In Circuit Programming using XWisp648, blinking a LED (of course), UART using serial connector, with tinybootloader and testing Reset-via-RTS feature (great), and USB-to-serial ! In the next post, I'll try to describe these experiments one by one. Sébastien Lelong & Richard Zengerink. I am a student of the Technological University of Paraná Federal (UTFPR) and I was very interressado the project since I could use it on some projects at the university. 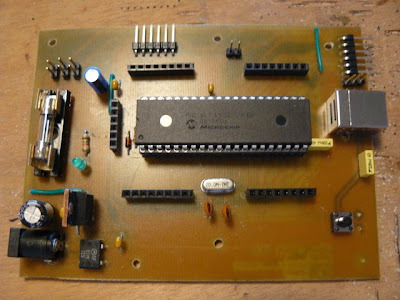 But I am not able to register in the forum nor download files to manufacture the board Jaluino Medium. Hi I have huge troubles with forums (spam) please join jaluino google group and I'll try to help you.